Ellie Buckley on new documentary Life, Animated. It feels pretty good to be Owen Suskind right about now. Words straight from the mouth of the star of Life, Animated, a documentary by Academy Award-winning director Roger Ross Williams. It follows the story of Owen Suskind and his family, and is based on his father Ron’s best-selling book of the same name. Owen is autistic, and the film examines the challenges and triumphs that came along with his diagnosis, and how he and his family learned to communicate together with the help of Disney animated films. Just before Owen turned three years old he fell silent; up until then, he had been a chatty and engaged child. A diagnosis of autism came soon after. In the years that followed, Owen did not speak, and his family were at a loss as to how engage him, and gain back the communication they once had. Owen had only one thing he really seemed to enjoy doing: watching Disney films. He watched old classics like Aladdin, The Little Mermaid and Peter Pan over and over again, stopping to rewind and re-watch certain parts many times. Repetitive and rigid behaviours are a core feature of autism, and we see this take form in Owen as he repeatedly watched the Disney films over and over again, intensely focusing on the language in particular. These repetitive and rigid behaviours can often be seen as debilitating. But intimate knowledge of these films lead to a breakthrough of communication between Owen and Ron, using the same language and stories. We see Ron recreate how he used a puppet of Iago, the parrot from Aladdin, to speak with Owen for the first time in years. It is an illuminating moment: Ron has found a way to connect with his son again. Ron is now an advocate of encouraging autistic children to engage with their passions, and for parents to use them to find a way to connect with their child. Ron and his wife Cornelia call this ‘affinity therapy’. As Owen grew older, he used the themes of the films to help understand incidents in his own life. We see him going through school, forging and breaking relationships, and becoming increasingly independent, all viewed through the prism of Disney stories. He has rote-memorised hundreds, if not thousands, of lines from his favourite films. On the day he moves into supported housing, Owen insists on watching Dumbo packing his trunk before he himself will pack: and on his first night away from his parents in his new apartment, he watches the scene where Bambi’s mother is killed, and Bambi must face the world alone. His passion for these films also leads to him running his own well-received Disney fan club. The goal of director Roger Ross Williams was to create a film that got inside Owen’s mind, and show us how Owen experiences the world. One of the techniques employed was filming Owen using an Interrotron camera, a camera behind a screen that display images or videos. This meant that Roger captured Owen’s expressions directly to camera, whilst Owen watched his favourite films. It is wonderful for viewers to see directly Owen’s sheer delight as he interacts with his favourite Disney films, laughing along and imitating lines perfectly in time and in character. Another technique used are animations of Owen as a wide-eyed young boy, interacting with other characters. These animations not only illustrate parts of Owen’s story, but the soundscape that is presented with them also gives us a glimpse into the sensory world of autism. There are garbled conversations where words are difficult to pick out, and the familiar sounds of day-to-day life become amplified and jumbled until it is mess of overwhelming sounds. These help illustrate the disorientating and distressing sensory overload that can sometimes occur in autism. 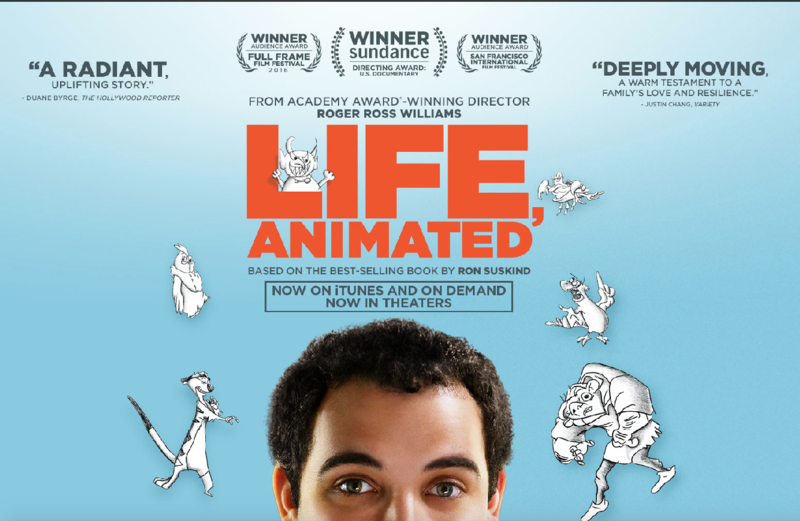 Life, Animated is a fantastic documentary, now nominated for an Academy Award, which covers the trials and tribulations of growing up. It is an uplifting look at one young man’s journey, with a central message that we should let people - autistic or not - be who they want to be, not what you want them to be. As Owen’s mother Cornelia succinctly puts it: who gets to decide what a meaningful life is? - Reviewed by Ellie Buckley, who is a PhD student at the Centre for Research in Autism and Education (CRAE) at UCL. Find out more about the film, which is on general release from today. For much more on autism, search our archive or find a free special edition in our free iOS/Android app.